Gozo Yoshimazu, an experimental Japanese poet, painter, musician, and shaman, is interested in breaking the written word open. A new career-spanning volume, Alice Iris Red Horse, gives a sense of his powers…[His] inclusiveness includes the universe and he invites us along. Yoshimasu Gozo’s groundbreaking poetry has spanned over half a century since the publication of his first book, Departure, in 1964. Much of his work is highly unorthodox: it challenges the print medium and language itself, and consequently Alice Iris Red Horse is as much a book on translation as it is a book in translation. Since the late ‘60s, Gozo has collaborated with visual artists and free-jazz musicians. In the 1980s he began creating art objects engraved on copper plates and later produced photographs and video works. 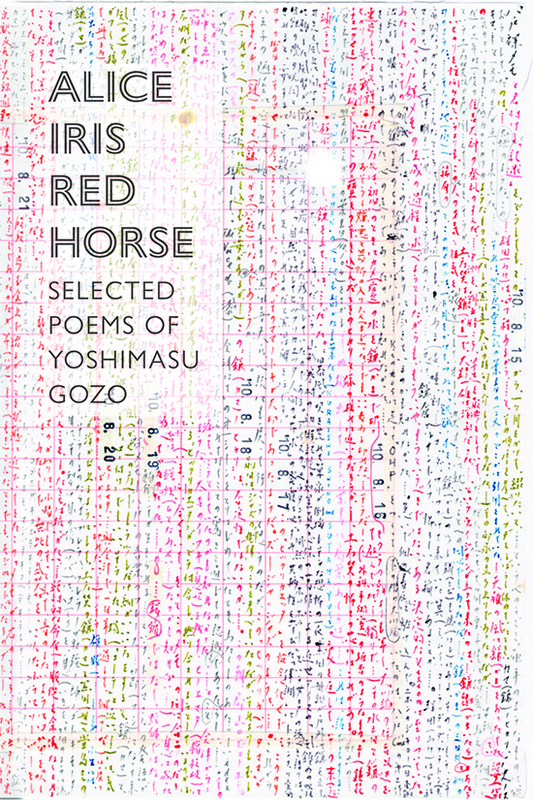 Alice Iris Red Horse contains translations of Gozo’s major poems, representing his entire career. Also included are illuminating interviews, reproductions of Gozo’s artworks, and photographs of his performances.Translated by Jeffrey Angles, Richard Arno, Forrest Gander, Derek Gromadzki, Sawako Nakayasu, Sayuri Okamoto, Hiroaki Sato, Eric Selland, Auston Stewart, Kyoko Yoshida, and Jordan A. Y. Smith. Introduction and notes by Derek Gromadzki. Edited by Forrest Gander. He became famous for his avant-garde work, which employs chance operations and other techniques, pushing Japanese poetry in radically new directions. Born in 1939, influential and innovative, Gozo is widely known for his visual art and performances. Gozo’s poems often explore, like Basho’s, moments in journeys that are at once physical and spiritual. His work sprawls, expanding and contracting like the universe.